“Baroness Royall of Blaisdon: My Lords, the Government have sponsored speculation about what they will, may or might do to maintain UK security, especially at the borders, on 30 November—everything from bringing in the Army to the idea of staff from the Prime Minister’s Office manning passport control points. However, people need and deserve stability. If they have booked a holiday that day, they need to know whether they can get away. If businesses have important customers coming to the UK, they need to know that their businesses will not be damaged. I should therefore be grateful if the Government would publish, clearly and fully, for the benefit of the country as a whole, what in detail they intend to do on Wednesday in relation to border security. Lord Henley: My Lords, I am very sorry that the noble Baroness the Leader of the Opposition did not take the opportunity to condemn the strikes that are taking place on Wednesday, which would have been helpful. If all parties agreed that those strikes should not happen we would not have this problem. We shall be operating the appropriate checks with the appropriate people, appropriately trained to make sure that visitors—whether they are coming here as tourists, whether they are coming here for business or whether they are returning UK citizens—can get in without any disruption or with disruption minimised as much as possible. The noble Baroness will also be aware that this is an operational matter and for security reasons it would not be appropriate to comment in detail, as she wishes, on the arrangements. Lord Tomlinson: Will the Minister comment on reports in today’s press that part of the police force is being drafted in to take over the role of the UK Border Agency at our borders and that their training is alleged to be merely 90 minutes? Is that adequate? Lord Henley: My Lords, I would not believe—and I would recommend that the noble Lord should not believe—everything I read in the press. I can assure him and the House that everyone assisting on this matter will have the appropriate training necessary to do the job. Yes, some police will be involved but they will have the appropriate training to do the job that they need to do. Lord Campbell-Savours: My Lords, the Minister said that staff started training in April. What were they training for in April? Lord Henley: My Lords, any sensible organisation, knowing there was a risk of such things happening—something which has still not been condemned by noble Lords opposite and I am waiting for that condemnation to occur—would make the appropriate arrangements. The border agency started that last April. Lord Grocott: Given that the Minister has repeated asked people on this side of the House to talk in terms of condemnation, can we take it as read that the Government condemn the cleaners, the dinner ladies, the low-paid workers and those threatened with a weakening of their pension entitlements and an increase in their contributions? Is the Government’s position that they condemn these people for trying in any way to defend their position? Lord Henley: My Lords, I condemn the strike as it affects our security and the arrangements we are having to make. That is the condemnation I am still waiting to hear from the party opposite. Lord Davies of Coity: My Lords, the Minister has repeatedly referred to this side of the House not condemning the strike. What I want to ask him is this—can he give a categorical assurance that the motivation of the coalition Government is security and not strike breaking? Lord Henley: My Lords, as I made clear in my original answer, our first priority, our highest priority, our top priority is the security of the United Kingdom. If the noble Lord thinks that we are involved in strike breaking he should think again. We want to make sure that our borders are kept secure. We think that the unions are endangering that security by the actions they are taking. The offer is still open to talk to the Government and others and we wish they would take that up. Lord Harris of Haringey: My Lords, of course our borders should be kept secure, but are the Government doing enough to negotiate with the unions on this point? Are the Government in fact making every effort to try to resolve this dispute rather than, as the Minister has told us, having been preparing since April for just this eventuality? Is it not that they actually wanted to provoke a strike, for whatever political reasons they may have? Lord Henley: Come on, my Lords. The noble Lord knows perfectly well that the Government’s doors remain open and that the Government are prepared to negotiate. It is the unions who are being intransigent and it is the party opposite which is refusing to condemn an action that will possibly endanger our security. Because of the actions we have taken, and have been taking since April of this year, we think that we will be able to keep security at the appropriate level at the borders on Wednesday. Baroness McIntosh of Hudnall: My Lords, given that the Minister is so fixated on the possibility of getting the kind of statement that he would like to hear from these Benches, does he imagine that the people out there who are contemplating going on strike are mostly or even to a small extent members of the party I support? I submit that not only are they not, they are members of all parties and none, and what is preoccupying them is not the question of whether the Labour Party supports them but their concern for their future pension rights. Lord Henley: My Lords, the noble Baroness accuses me of being fixated on this issue and perhaps I am somewhat naive to be so fixated on this issue. I do not know in which way the members of the unions involved happen to vote. I happen to know that those unions support the party opposite. That is why we are still waiting for that condemnation from the party opposite. Baroness Royall of Blaisdon: My Lords, does the Minister agree that any strike is a demonstration of failure? Does he further agree that the Government themselves have failed to resolve this strike? I see that Ken Livingstone is planning to reverse Mayor Boris Johnson’s abolition of the Zone 2-6 Travelcard. This is welcome news for the very many people who travel around London but have no need to go into the centre. “Day travelcard users on London’s Underground and buses face price hikes of up to 74% from 2011. The Zone 2-6 Travelcard will be withdrawn meaning passengers wishing to continue using travelcards will have to buy a Zone 1-6 version instead. This would mean a peak hours ticket rise from £8.60 to £15. Tube bosses said they were simplifying fares, but watchdog London TravelWatch said outer London residents and tourists would be worst affected. 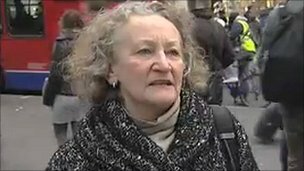 “We are very concerned that these inflation-busting fares will price people off public transport,” said Jo deBank from London TravelWatch. I wonder if he will be amongst those welcoming Ken Livingstone’s announcement. Is this the nnext battle that Mayor Boris Johnson will try to pick with the transport unions? It is noteworthy that there have been as many strikes on the London Underground in three years of the Boris Johnson Mayorality as there were in the full eight years when Ken Livingstone was Mayor. Cynics suggest that (1) Mayor Boris Johnson doesn’t care because he never uses the Underground and (2) he believes that the more disruption there is on public transport due to poor industrial relations the more he can try to blame the Labour Party (despite the fact that the RMT is not affiliated to the Labour Party). So perhaps there is a Tory masterplan after all which envisages provoking major industrial relations problems in London in the run up to next year’s Mayoral elections. “Donovan also pointed out that Boris’s police budget is totally unsustainable, relying on £70m of reserves built up in police and fire budgets over the previous ten years. In fact Boris will create exactly the kind of “black hole” that he accused Ken Livingstone of creating in TfL’s budget before the 2008 election. “And it’s not just money that will run out after Boris’s first term but ideas as well. I mean what major new transport projects conceived by Boris are set to go ahead over the next five years? We’ll have a few extra bikes and a few new buses with a hole in the back, but where are the big ideas for London going into the next few years and decades? Of course there’s still time for Boris to spell out those big ideas, but even if he does they would be too far down the pipeline to be seen under a second Boris term. Because the sad truth about Boris as Mayor, is that rather than be the triumph or disaster many predicted, he has actually been something of a non-event. Is Mayor Boris Johnson’s £50 million Olympics deal with the Chinese going to threaten our security? “A Chinese company is offering Britain £50 million of ‘aid’ to put in a free mobile phone network in time for the Olympics. This proposal has the support of Mayor Boris Johnson. “The offer has been made only two years after intelligence chiefs warned that China could have the capabilityto shut down Britain by bringing down its telecoms and utilities systems. They raised fears that equipment already installed by Huawei in BT’s network could be used to cripple vital services. I have been concerned about Huawei for some time. We are breath-takingly complacent about the vulnerability of our critical national infrastructure and – particularly in the current economic climate – there seems to be no appetite from the Government to prevent huge chunks of it falling into foreign hands. This is potentially another example – aided and abetted by Mayor Boris Johnson. These are serious matters and a serious London Mayor should not complacently give his support, presumably he hopes that if his eyes are firmly closed and his fingers are crossed that it will all be OK.
How safe will be the “super virus research centre” in St Pancras? I have tabled a Parliamentary Question to ask Her Majesty’s Government what consideration have Ministers given to mitigating the security issues surrounding the location in St Pancras of the UK Centre for Medical Research and Innovation and its laboratories that will be working with highly dangerous viruses? “One of Britain’s leading bio-scientists .. [has] .. voiced fears over the safety of a £600 million virus “superlab” planned for St Pancras. UK Centre for Medical Research and Innovation is to be built in London on the redeveloped St Pancras site. In principle, this is excellent news. However, the laboratory could be a magnet for terrorists. “The issues are if you have an earthquake, some idiot lets a bomb off or there’s a fire at St Pancras International. “These are extreme examples but you don’t want that building to suffer a serious knockabout when you’ve got this material in there.